Freshman blocker Kyle Rehkemper (right) had three blocks in a crushing 3-0 loss to Sacred Heart Saturday afternoon. The rookie is ranked second in blocks per set this year for a young Crimson squad that has dropped its past three matches after losing only one of its first six contests. 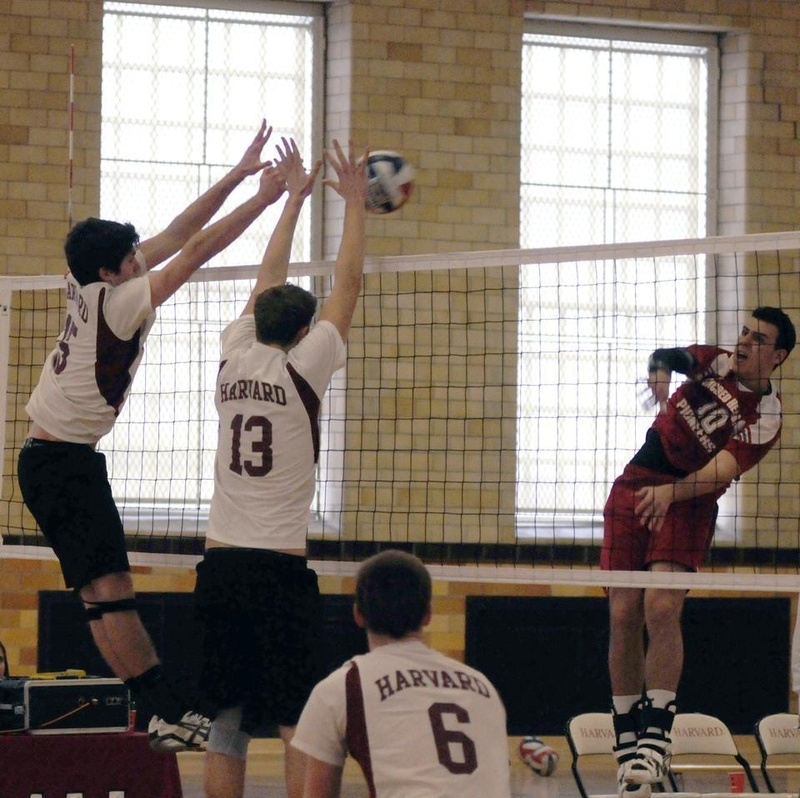 If effort were all that mattered, then the Harvard men’s volleyball team would be undefeated this season. But despite the best attempts of the Crimson (6-4, 0-2 EIVA Hay), Sacred Heart (6-3, 2-1) took a quick 3-0 victory Saturday afternoon at the Malkin Athletic Center. The loss was the third in a row for Harvard, which started its season 6-1. Harvard started the first set trading points against the Pioneers. With the score tied at five-all, the Crimson rallied behind several blocks from the front row to a 7-5 lead. Although Harvard missed several serves early, it was able to compensate for the errors with a series of kills. But the lengthy front row of Sacred Heart made life difficult for the Crimson hitters, and Sacred Heart rallied to tie the score. Junior Matt Jones then floated one to slow the Pioneers’ momentum, and freshman Kyle Rehkemper aced the next serve to maintain the Harvard lead at 15-12. But even that was not enough to stop Sacred Heart, as the visitors used a strong service game in combination with great blocking to take the set, 25-18. Sacred Heart began the second set with three straight points, but Harvard took a lengthy rally followed by a quick kill to keep it close at 3-2. Just as in the game before, the Crimson found no answer to the Pioneers’ offensive rhythm, and quickly found itself in a 9-6 hole. Despite tying the score in the middle of the set, Harvard could not find its groove late, as Sacred Heart dominated at the net to take the set, 25-18. The two teams traded points to start the third set, and Matt Jones crushed one to tie the game, 3-3. The Crimson hustled after every point, but could not find an answer to Sacred Heart’s offense. A block by freshman Nick Madden tied the game at six-apiece, and sophomore Rob Lothman tallied a deep ace. With the momentum firmly in its possession, Harvard used a great block by Jones to rally to an 8-6 lead, forcing a Pioneers time-out. A solid defensive series for the Crimson gave it a 10-7 lead early in the third. Just when it appeared Harvard had hustled its way into another point, a controversial lane violation kept Sacred Heart close at 10-8. Hosting Sacred Heart at the Malkin Athletic Center, the Crimson thrashed the visitors, 3-0, to strengthen a hold on second place in the EIVA. Harvard is now two games behind league-leading Penn State, which has won 17 straight conference titles.